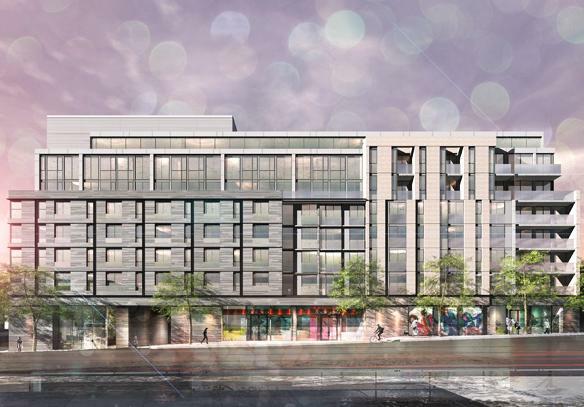 Urbancorp has released the first rendering of the Homes of St. Clair West, a new condominium development along a vibrant stretch of the established St. Clair West neighbourhood. The eight-storey, 100 plus unit condominium is being designed by TACT Architecture Inc., a notable Toronto-based firm. The Homes of St. Clair West, located at 836 St. Clair Avenue West, is less than a twenty minute walk from the St. Clair West subway station. Plus, the 512 streetcar is literally on the doorstep. The area offers a diverse array of ethnic cuisine. Thai, Indian, Peruvian, Caribbean or Japanese food — it’s all there. Art galleries, boutiques, banks and grocery stores are also nearby. Potential buyers are encouraged to register online with the Homes of St. Clair West and stay tuned for more info to be released shortly on the development. For more information, please visit www.urbancorp.com.